The Platinum Alkaline Water Ionizer machine by Bawell is a sleek and sophisticated way to alter tap water. It is not like ordinary water filters. In terms of drinking water, the alkaline water ionizer manipulates the pH balance to provide a number of health benefits. It can also be used to create acidic water for cleaning and sterilizing. The machine is a countertop unit. It is incredibly easy to set up and start using. All it requires is an outlet to power the unit and a water source. For easy access, the machine attaches to the faucet. It is small enough to stash away when not in use. It can also be hooked up to the water line below the sink for a more permanent installation. Appearance wise, the machine looks like a professional kitchen appliance. Its streamlined stainless steel body looks great. The controls are found on the front and are accompanied by a touch LCD screen. The screen is brightly illuminated and gives you detailed measurements of the pH balance and ORP value. It also provides information about the electrolysis settings that are being used. For convenience, the machine includes a number of buttons based on your needs. You can turn on the unit and get water with a press of a button. The unit has a number of modes with preset settings. For alkaline water, there are 4 levels ranging from weak to ultra strong. There are also 3 acidic levels ranging from weak to strong. It also includes a mode for simple purification with a neutral pH balance. For further control, there are 5 power settings. In total, the Bawell Plantinum Alkaline Ionizer has 35 preset alkaline and acidic water levels. 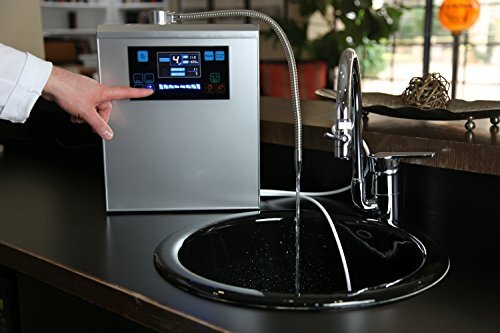 In addition to the LCD screen, the machine has voice indications to inform you about the water you are getting and to guide you in the right direction. The biggest benefit of this machine is its ability to provide alkaline ionized water in an instant. Alkaline ionized water has been proven to have antioxidant properties. This comes from the negative oxidation reduction and pH balance. Several studies have shown that drinking the recommended amount of daily ionized water can improve one’s overall health. It’s been known to increase energy and improve common ailments. The machine alters the composition of the water via electrolysis. This separates the minerals in the water. The Bawell Platinum Alkaline Water Ionizer allows you to create water with a pH balance between 2.0 to 12.0 and an ORP value of +600 mV to -800 mV. The pH balance can be altered based on your needs. For cleaning and sterilizing, the ionizer can create acidic water with a higher pH balance. Acidic water can be used to cut through grime and leave surfaces sterilized. Ultimately, the ability to create acidic water can save you a lot of money in cleaning supplies. Professional kitchens often use acidic water to clean dishes. It ensures that germs and bacteria are removed, lessening the chances of food borne illnesses. Additionally, acidic water can be used to clean other surfaces around the home. 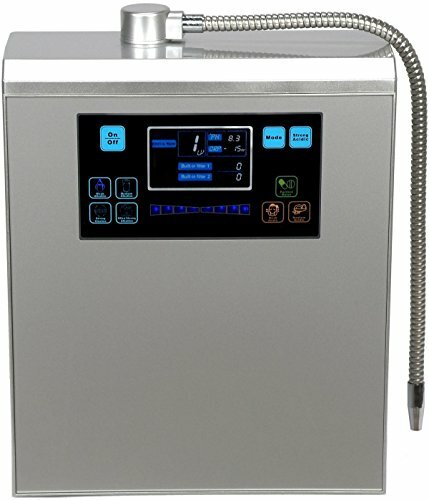 The Bawell Platinum Alkaline Water Ionizer uses a dual filtration system. The filtration system can remove impurities as small as .01 microns, leaving the water purified and ready for drinking. It removes impurities while leaving behind healthy minerals. It also has a forever lifetime warranty. Should the machine fail in any way, Bawell will fix or replace the machine. This ensures that your investment is protected. You’ll always have clean and healthy water. Bawell has gone out of their way to make this machine as user-friendly as possible. First off, the machine is compact and easy to install. You can hook it up and start getting alkaline water within minutes. Additionally, there are over 35 preset water options. The controls are bright and easy to read. There is no need to input specific numbers. You can find a setting based on your preference or needs. You can switch from moderately strong alkaline water for drinking to highly acidic water for cleaning in an instant. With the inclusion of voice indications, you’ll never be lost. The machine will guide you as you use it. While this is a great machine, there are some cons. One of the biggest is the price. The machine is quite pricey, costing well above other kitchen appliances. That being said, it you take into account the price of bottled alkaline water, it may be worth the investment. The price of ownership is another con. The dual filtration system is a great feature, however, it comes at a cost. The two filters must be replaced on a yearly basis to stay effective. The price of the filters are quite substantial. Overall, the Bawell Platinum Alkaline Water Ionizer is well worth the investment. It’s an easy-to-use machine that gives you complete control of your water. In the long run, the health benefits the alkaline water will give you is priceless. If you are looking to ditch bottled water and improve your overall health, this machine is for you.